An original oil painting inside of the artists studio with his cat by Leif Nilsson. This large oil painting of the artists studio interior was painted by Leif Nilsson in his studio directly from life in March of 1997. It measures 48 inches by 54 inches, unframed and is 53 inches by 59 inches framed. 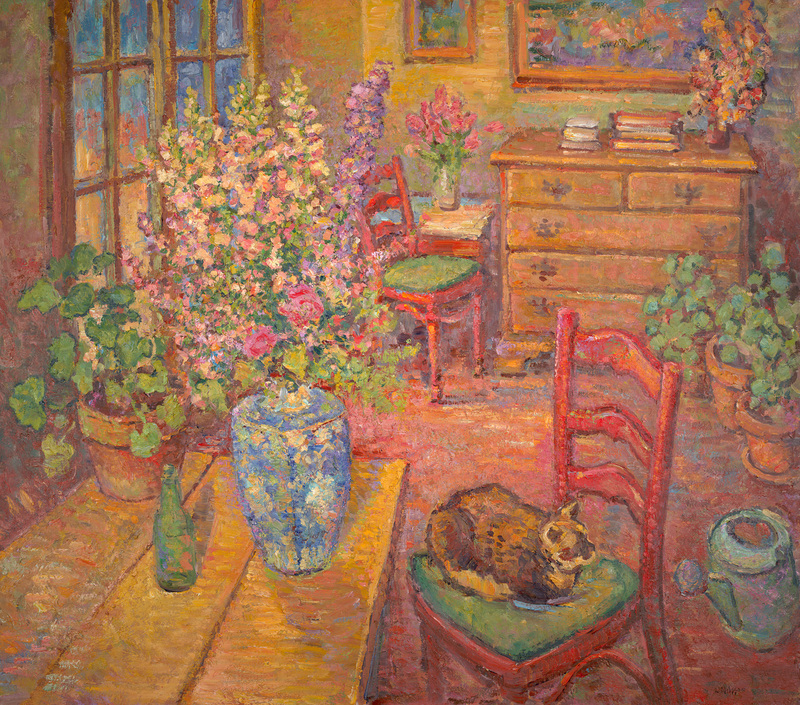 It depicts the interior of his studio with his faithful cat Calisimo posing on the red chair, waiting for her afternoon meal. Other elements in the composition include the watering can and potted geraniums that survived the winter and began to bloom again. The dried flowers on the bureau were cut from their plants by a hail storm the year before. The fresh flowers in the blue vase came from the local florist, Nancy Ellen's Garden. For more interior paintings click here.